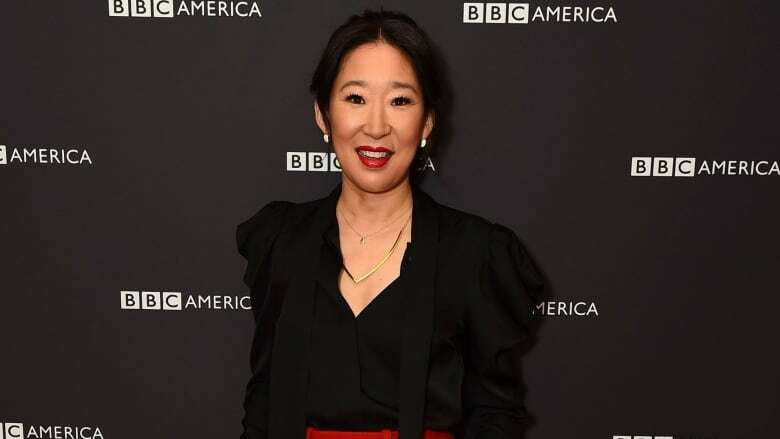 Ottawa native Sandra Oh made history Thursday as the first Asian woman to be nominated for an Emmy Award for lead actress in a drama series, a category that includes another Canadian: Tatiana Maslany. Oh, 46, is a contender for playing an MI5 operative hunting down a female assassin on BBC America's Killing Eve, which debuts in Canada on July 22 on Bravo. She was previously nominated for five Emmys for her supporting role in the medical drama Grey's Anatomy, in which she endeared herself to audiences with her portrayal of steely perfectionist Dr. Cristina Yang for 10 seasons. In a written statement, Oh said she feels "tremendous gratitude and joy with this nomination. I am thrilled for [creator] Phoebe Waller Bridge's nomination and for the entire cast/crew of Killing Eve. I share this moment with my community. "P.S. I think my mother at this moment may actually be satisfied." In a recent phone interview from London, where she's shooting season two of Killing Eve, Oh said, "I love the style, I love the genre of thriller." "I love playing a character that is able to express an entire range and an entire rainbow of, not only emotions, but depth in characteristics and qualities." Meanwhile, Regina-born Maslany is in the running for playing multiple clones on the fifth and final season of the sci-fi series Orphan Black, which wrapped last August on Space. She won the Emmy in the same category in 2016 and was nominated in 2014. Maslany is now starring in the off-Broadway Tracy Letts play Mary Page Marlowe, which began previews on June 19 and was set to open Thursday. In a statement, she said her nomination was "completely unexpected." She paid homage to the show's fan base as well as her fellow contenders, who also include Claire Foy for The Crown, Keri Russell for The Americans, Elisabeth Moss for The Handmaid's Tale, and Evan Rachel Wood for Westworld. 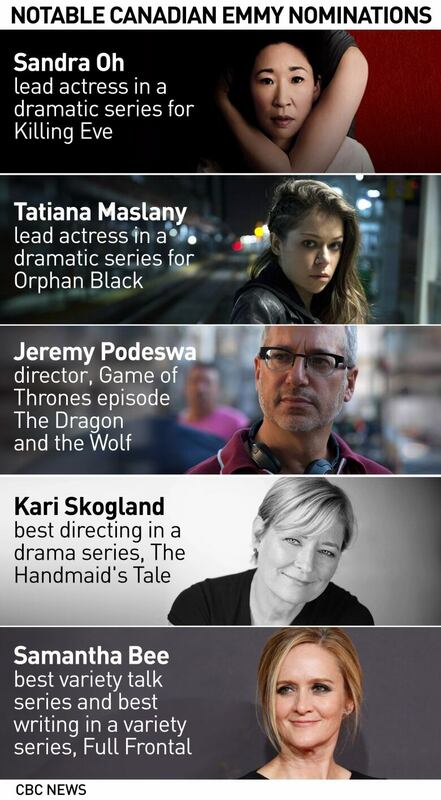 "So excited to be sharing the category with all these amazing women," Maslany said. "So happy Sandra Oh's phenomenal work is being recognized!!" 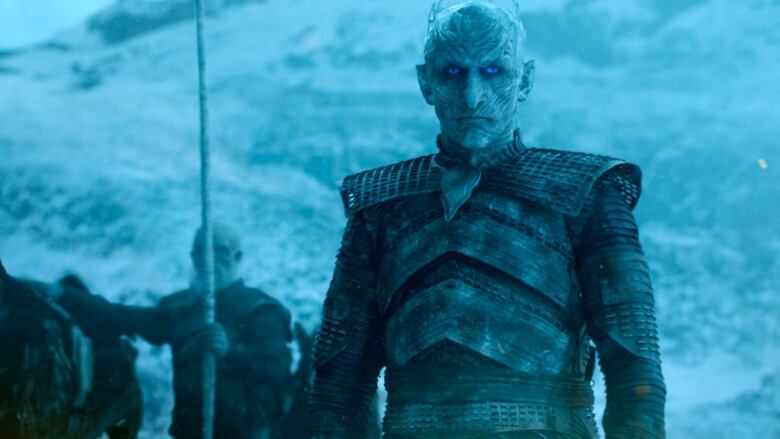 Game of Thrones roared back onto the Emmy battlefield, topping Thursday's nominations with 22 nods. HBO's fantasy saga is a two-time best drama winner that sat out last year's Emmy Awards because of production delays. 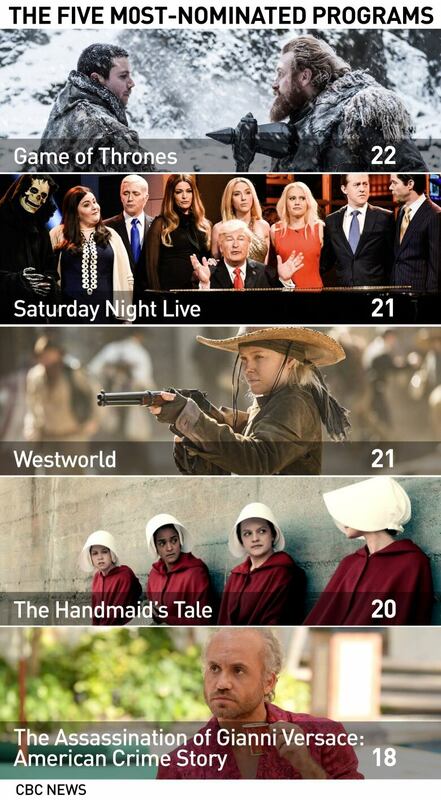 It's returning to face formidable competition: The Handmaid's Tale, the dystopian sci-fi series that claimed top drama honours last year, drew 20 bids, with Westworld close by with 21. The nominations for the 70th Primetime Emmys held a clear sign of how much the ground is shifting under the TV industry. Streaming service Netflix captured the most nominations overall, 112, taking away a title that HBO held since 2001 and giving broadcast TV more reason to fear its future in awards and viewers. Game of Thrones helped boost the premium cable service's total and became the most-nominated series of all time, with its 129 nods topping the 124 nominations earned by ER. Donald Glover's Atlanta is the top comedy with 16 bids. It will face newcomers including The Marvelous Mrs. Maisel and Barry, starring Bill Hader. The short-lived reboot of Roseanne, cancelled because of star Roseanne Barr's racist tweet, drew only one major nomination — a supporting actress nod for Laurie Metcalf. Another revival, Will & Grace, got Emmy love for nominees Megan Mullally and Molly Shannon but the main stars and series itself were snubbed. Saturday Night Live, riding high with its relentless pillorying of the Trump administration, was rewarded with 21 nominations. The previous high for Game of Thrones was 24 nominations in 2015. It got 23 nods in 2016 but wasn't eligible last year because of a production delay. The Emmys ceremony airs Sept. 17 on NBC with Colin Jost and Michael Che of Saturday Night Live as hosts. 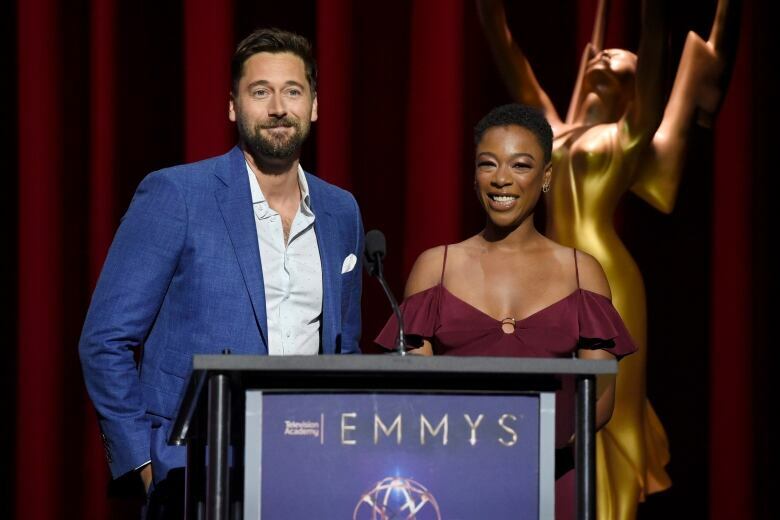 Actors Samira Wiley of The Handmaid's Tale and Ryan Eggold, who starred in The Blacklist, read this year's nominees. Full Frontal with Samantha Bee, hosted by the titular Toronto-born comedian, also received a nod for Outstanding Variety Talk Series. The nominees for best actor in a drama series include: Jason Bateman, Ozark; Sterling K. Brown, This Is Us; Ed Harris, Westworld; Matthew Rhys, The Americans; Milo Ventimiglia, This Is Us and Jeffrey Wright, Westworld. 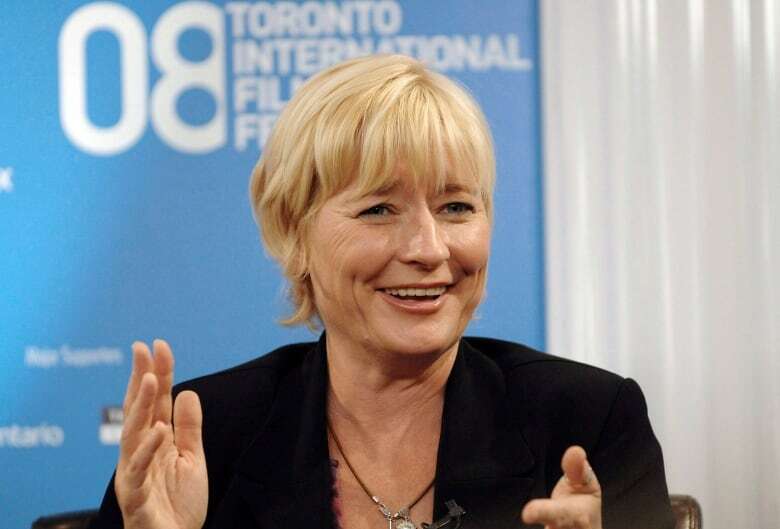 Other Canadian Emmy nominees this year include Ottawa-born Kari Skogland for best directing in a drama series on the second season of The Handmaid's Tale. Inspired by Toronto author Margaret Atwood's 1985 dystopian novel, the Canadian-shot Bravo and Hulu series has struck a chord in the #MeToo era with its focus on women's role in society. "When you're working on a project that is really resonating around the world, I think you feel the power of that," Skogland said by phone Thursday from Toronto. "And you're also very humbled by being involved with something that is making such a strong statement in such a powerful way." This is the first Emmy nomination for Skogland, whose previous projects include Boardwalk Empire, The Borgias and Vikings. Her competition includes Toronto native Jeremy Podeswa and Ottawa-raised Alan Taylor for HBO's Game Of Thrones. Earlier this year Skogland won a BAFTA trophy for directing on season 1 of The Handmaid's Tale. She said the show, along with the #MeToo movement, have helped take her career to a new level. "Until the #MeToo movement, I would say I arm-wrestled my way into every project to get noticed," Skogland said. Several other Canadians who worked on The Handmaid's Tale also scored Emmy nods for makeup, sound mixing and visual effects. Full Frontal with Samantha Bee, hosted by the titular Toronto-born comedian, got a nod for best variety talk series. Bee is also up for best writing in a variety series — a category that includes two other Canadians: Montreal's Barry Julien, a writer on The Late Show With Stephen Colbert, and Toronto-raised Saturday Night Live creator Lorne Michaels. Martin Short, who grew up in Hamilton, Ont., is nominated along with Steve Martin for writing in a variety special for Netflix's Steve Martin & Martin Short: An Evening You Will Forget For The Rest Of Your Life. Canadian composers Mychael and Jeff Danna for their score on CBC-TV's adaptation of Atwood's novel Alias Grace. Danna for best original main title music for the now-cancelled period drama The Last Tycoon. Toronto producer John Weber for best children's program for the Netflix adaptation of A Series Of Unfortunate Events. Montreal production designer Elisabeth Williams for work on two episodes of The Handmaid's Tale. Craig Mann of Oakville, Ont., for sound mixing on Paramount Network's miniseries Waco. Ottawa-born Vice Media co-founder and executive producer Shane Smith for best information series or special for Vice on HBO. Music stars in competition for Emmys this year include John Legend, Bruno Mars and Sara Bareilles. 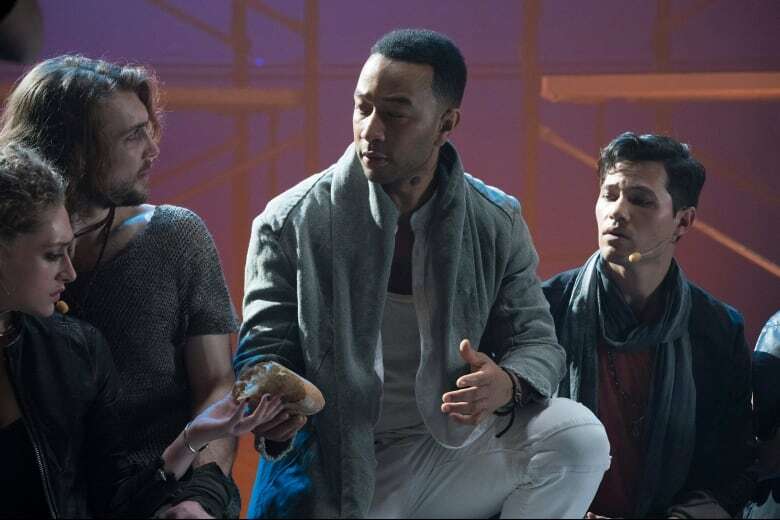 Legend and Bareilles each earned acting nods for their roles in NBC's Jesus Christ Superstar Live In Concert. Mars earned a nomination for outstanding music direction for his first TV special, CBS's Bruno Mars: 24K Magic Live at the Apollo. Legend, who has won several Grammys, an Oscar and a Tony, could become a so-called EGOT if he takes home outstanding lead actor in a limited series or movie. The term EGOT refers to someone who has won one of all the major awards: an Emmy, Grammy, Oscar and Tony. Benj Pasek and Justin Paul are also on their way to EGOT status: The composing duo earned a nomination for outstanding original music and lyrics for In the Market for a Miracle from Fox's A Christmas Story Live! The nominations for outstanding reality competition show are: The Amazing Race, American Ninja Warrior, Project Runway, RuPaul's Drag Race, Top Chef and The Voice. The field is identical to last year when The Voice took home the Emmy statuette. The Voice and RuPaul's Drag Race tied for most nominations for a reality program with 10 each.